Walter Calderwood was a Maryhill Harrier whose involvement went from the very early 1920’s right through to the pre-war teams of Emmett Farrell and McNab Robertson. A whole hearted clubman and always an honest racer, he was an internationalist on track and over the country. He first came to the notice of the Scottish athletics public as a cross-country runner and we will start with his international debut. Running in the Scottish Cross-Country Championships at Musselburgh in March 1922 Calderwood did well enough in the Maryhill Harriers team that finished fourth to be selected for the International to be held at Hampden later that month. The race started at half-time in the Queen’s Park v Celtic FC football match and, possibly as a consequence, 10000 programmes for the race were sold. Calderwood finished eighteenth in the team that finished third: this was to be the only time in four outings in the International Cross-Country Championship that he was to be a scoring runner. Finishing as fourth Scot, he was preceded by Wallach (4th), Craig (8th), Wright (10th) and followed by Cuthbert (21st) and Riach (26th). The following summer, the sport was well supported – eg at the Shettleston Harriers meeting at Celtic Park at the end of May, there were 143 entered for the half-mile, 101 for the three miles, 122 for the 100 yards, 115 for the 220 yards and 75 for the quarter-mile! Given the handicapping system in operation, it was difficult for runners to make any impression unless they were friendly with the handicapper or of exceptionally good quality. The coverage in the Glasgow Herald was scanty: there was a weekly column entitled ‘Notes on Sport’ with a sub-heading ‘Cricket and Athletics’. Cricket took up two thirds of most columns and athletics was always the second sport to be covered. There was only room for the winners (a state of affairs that obtained for the SAAA Championships) and in most cases only the winners were noted. This is a roundabout way of saying that Calderwood was not noted in the results at any meeting during the summer of 1922. In season 1922-23, there was no Maryhill team in the District Championships, but Calderwood ran in the National and ran well. The report in the Glasgow Herald read: “The race was over a 10 miles course in the policies of Bothwell Castle and there was an entry of 21 teams of 12 runners (6 to count), with 6 aspirants for individual honours. The field got away to a good start, and early in the race AB Lawrie (Glenpark) went to the front followed by D Wright (Clydesdale) and WH Calderwood (Maryhill). At the beginning of the second lap the leaders were D Wright, JG McIntyre (Shettleston) and A Craig (Bellahouston) with W Neilson (West of Scotland), JMcIntyre (Garscube), AB Lawrie and WH Calderwood close up. When the final lap was entered, Wright had a lead of 50 yards from McIntyre (Shettleston), and Lawrie had moved up to third place. Wright increased his lead to 100 yards when the final straight was entered, running out a popular winner.” Calderwood was seventh or eight and was selected for the Scottish team. The international was held later in March, and Calderwood did not finish the race. On into the summer of 1923 and the first SAAA Championship medal. In the SAAA event on 23 June at Celtic Park he was 3rd in the 4 Miles. He had shown some form in the weeks leading up to the event. In the Queen’s Park FC Sports on 2nd June he led the Maryhill Harriers team to second place in the Two Miles team race. On 3rd August he ran well at Ibrox in the Rangers Sports in the one-and-a-half-mile invitation handicap where, after Duncan McPhee dropped out of the race, “T Riddell of Glasgow High School almost provided a rich surprise here but the reserve power behind the Maryhill man, WH Calderwood, was too much for this youthful runner.” It was the best run of the summer for the Maryhill Harrier. Calderwood is not noted in any of the major championships during winter 1923-24 but he was in serious action the following summer. 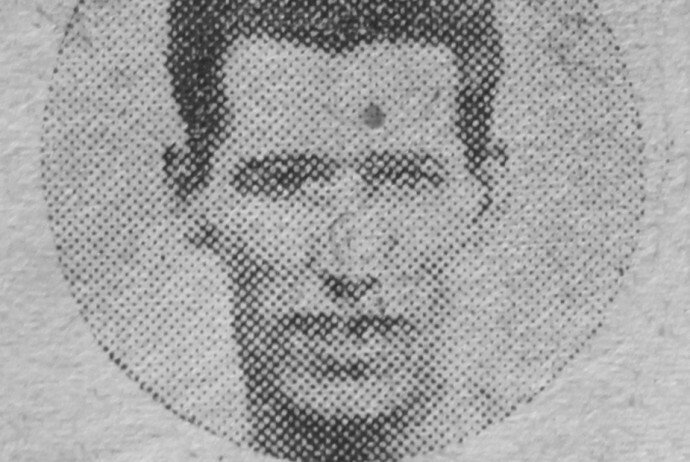 On 19 April 1924 at Celtic Park in the SAAA 10 Miles championship, he was third. The race was won by JG McIntyre from Dunky Wright by 20 yards and ‘fully 100 yards’ between Wright and Calderwood, who had run at the elbow of the leader for six and a half miles. At the Shettleston Harriers Sports on 31st May, Calderwood won the Two Miles in 9 min 47 1-5th sec from D McLean (Wellpark). The Queen’s Park Sports on 7th June held what were grandly called Olympic trials and in that for the 880 yards, Calderwood won by a yard from JD Hope and RB McIntyre. The SAAA Championships in 1924 were held on 14th June at Hampden Park where Calderwood, running in the Mile finished third and was a member of the winning relay team. Two weeks later, 28th June, he won the Mile at the Glasgow Police Sports by one yard from J Mitchell of Mauchline Harriers, having started from a mark of 40 yards against Mitchell’s 48. He was not recorded as winning anything at the Partick Thistle or any other sports over the following weeks – cricket was the sport which was receiving all the coverage over the sumer season – pages and pages of it reporting on Scottish and English cricket plus Test Matches while athletics was often reduced to half a column of close print. Then on 12th July he was noted as being third in the Mile at Lochwinnoch AAA Sports. One week later after ‘an exciting race’ he dead-heated with RR McIntyre at the West Kilbride AAC Sports over the Mile for the championship of Ayrshire in 4:30 sec. Glengarnock Works Social Club held their sports on 27th July and although he was probably racing as an individual, he only appeared on the prize-list as a member of Maryhill’s winning one mile relay team. Thereafter, despite there being several meetings most weekends there is no sign of Calderwood among the prizes – he was maybe handicapped out of it, of course. March 7th, 1925 saw the National Cross-Country Championships and Calderwood was part of the Maryhill Harriers team that finished third. Sixth scoring runner for the club he was forty seventh. Straight into the summer season. On 6th June at the Queen’s Park Sports he was running in the three miles team race where he finished third individual behind Tom Riddell and D McLean. 20th June at the Glasgow Police Sports, he was in the winning One Mile Relay team and no doubt took part in other events where he was not among the prizes. Nor did he seem to have competed in the SAAA Championships at the end of the month with his name not being listed among the medallists. Second in the half mile at Firhill in the Partick Thistle Sports, it was hinted that the handicapper had not been kind to him. The main talking point at the West Kilbride Sports was the non-appearance of WH Calderwood who had dead-heated the previous year for first place in the Ayrshire Mile Championship. In fact he does not seem to have picked up prizes anywhere thereafter, not even at the Rangers or Celtic Sports which were held two weeks apart in August. The winter started with the cross-country relay in November. Maryhill was unplaced but Calderwood was fifth fastest of the runners taking part. The National confirmed his fine form when he was fourth, two places ahead of Alex Pirie of South London Harriers. This gained him selection for the International held in Brussels later in March where he failed to finish. The track season coming up was to be another good one for Calderwood who would win his first Scottish track championship. He started championship month by not winning anything in the first three weeks and then on 26 June 1926 in the SAAA championships at Hampden Park he won the Four Miles in 20:31 4-5th sec from Frank Stevenson and Dunky Wright. His first championship victory and some very good scalps! On 10th July in the International against England at Hampden Park, he ran in the Four Miles but was not in the first three finishers. He was known to finish the season well, and on 2nd July, at Celtic FC Sports there was a special handicap over 880 yards to give D Hope a chance of breaking the record but “Hope ran well and failed by three yards to give WH Calderwood twelve yards. The winner’s time of 1 min 57 4-5th sec is the same as the Scottish record.” Three weeks later in the Ayrshire Championships at Rugby Park, Kilmarnock, Calderwood the most exciting race of the afternoon, the half mile, in a slow time of 2:04 after a tussle with J Calder of Beith and P Nicol of Kilmarnock. At the Rangers FC Sports on 6th August, Calderwood was second to England’s C Ellis in a ‘first class mile’ in which he had been given 40 yards in the handicap. In cross-country season 1927-28, There was controversy right at the start. In the District Relays at Shettleston, the scrutineers took exception to the inclusion of one of the runners in the Maryhill Harriers second team; the club retaliated by pulling both teams out of the event. This meant no race for Dunky Wright, Tom Blakely or WH Calderwood. They were in better humour by the time of the National, had the teams entered properly and won the title. Calderwood ran very well indeed and finished third and first counter for the winning Maryhill team. If we pick up the ‘Glasgow Herald’s’ report at the end of the second of four laps we read, “At the end of the next lap – time 19 min 06 sec – the leading group included Suttie Smith, Calderwood, Stevenson, Henderson, Wright, Wood and Mitchell. During the next lap, Smith and Stevenson gradually pulled clear of the field. At seven miles or thereby, both were together, about 40 yards in front of Calderwood. Several yards behind Calderwood came JF Wood and Cpl Sutherland. At this time it was evident that the individual race rested with Smith and Stevenson, the Junior championship for Wood or Sutherland and the team race for the holders, Maryhill Harriers. Going for the last lap the leaders steadily increased their pace and tenacious as Frankie Stevenson usually is, he had to allow Suttie Smith to go ahead. …. Frank Stevenson beat Calderwood (who also ran very well) for second.” The difference between Suttie Smith and Calderwood was only 26 seconds and between Stevenson and Calderwood 18 seconds. Behind him came Sutherland, Wright, Tombe, Gunn and Wood – all very good runners indeed. Later in March 1928 in the International Cross-Country Championships he finished 37th and not a counting runner. On 2nd June St Peter’s AC held an inter-club team contest which included six relays! Maryhill Harriers won four of them. The events were the 440 yards relay, 880 yards relay, Mile relay, Two Miles relay, Four Miles relay and 440 yards hurdles relay. Maryhill won the 880 yards, Two Miles and Four Miles relays and also the Three Miles team race. Calderwood ran in the Two Miles and Four Miles relays and finished fifth in the Three Miles team race. A strenuous afternoon running for points for the club in the same month as the National Championships. On 23rd June 1928 in the SAAA Championships at Craiglockhart, he was second in Mile to clubmate D McLean. Seven days later he ran as a substitute for McLean in a medley relay race against Edinburgh University and was second after his two lap stint, a gap his team mates were unable to claw back. On 14th July he was back in action at the West Kilbride Sports where he won the Ayrshire Mile Championship in 4:49.8. At Greenock on 28th July, Calderwood won another open mile quite comfortably. Then came the Rangers Sports on the first Saturday of August where he was entered in the special three quarter mile race featuring Ray Watson an American middle distance star. It was said to be the race of the meeting. “Watson who was on the scratch mark and conceding starts of up to 77 yards, ran so well in the early stages that he was on terms with the field in the final lap and was apparently under the impression that lying behind the leaders he need only make his effort entering the final straight to win easily. He however was unaware that during the past month WH Calderwood had been specialising in sprinting in the company of C Ellis, the AAA champion, and although the American was out on his own sprinting to the tape, he was unable to resist the overwhelming challenge delivered by the Maryhill man in the last 80 yards and was beaten at the tape by a clear two yards. Calderwood’s winning time was 3 min 4 2-5th sec from 22 yards and so well was he moving that it is just a pity that he did not run out the full distance, as D McPhee’s Scottish figures of 3 min 12 2-5 sec seemed well within his grasp. Although defeated Watson had the satisfaction of returning the excellent time of 3 min 4 4-5th sec which is 1 sec faster than the previous British record created by AG Hill, the double Olympic winner, at Salford in 1921. Calderwood’s judgment in this race was perfect and it is questionable if he has ever run a better race in his career. It was refreshing after some of the performances he has given this season.” Very complimentary even if the final sentence could be rephrased as “And about time too.” Maybe a wee bit off after the results noted above. And so the summer season drew to a close and the new competition season of 1928-29 started. In the Midland District Relay in November 1928, Calderwood had the third fastest time of the afternoon for the Maryhill team that was fourth. The men in front of him were Girvan (Garscube) and Stevenson (Monkland). Came the national in 1929 and he was eleventh – not good enough for selection for the international but good enough to be third counter for the Maryhill team that finished first. Another gold and bronze for his medal cabinet. This set him up for a good summer to follow and another SAAA gold medal. In the Queen’s Park FC Sports on 1st June, Calderwood won the first class mile. At the time it was not uncommon for popular meetings to have two races in well supported events: the mile was one of the more popular and so the runners were seeded and races held for the Mile (first class) and Mile (second class). Calderwood was invariably in the first class races. St Peter’s AC Sports were held on 8th June and again there was a series of relay races involving the top clubs. Maryhill won the Two Miles Relay and the Four Miles Relay with Calderwood in both teams. His next outing was in the SAAA Championship at Hampden on 22 June where he won the Mile in 4 min 29 4-5th sec. The report read: “His previous performances this season had shown that Donald McLean had lost much of his form, but it is questionable if at his best he could have given anything to WH Calderwood, the victor in last Saturday’s mile. Calderwood not only ran with the better judgment but carried the stronger finish and his time, 4 min 29 4-5th sec represented good running.” Selected for the triangular international in Cork on 13th July, he was unplaced in the Mile. On 20th July at the Beith Harriers meeting, he was third in the 880 yards, running off 5 yards, behind Edmiston of Maryhill (58 yards) and Govan of Shettleston (47 yards). He finished his season on 24th August in Yorkshire at the Leeds Cross-Country Association Sports where Maryhill Harriers won the team race with Calderwood being fifth and first club runner home. In the Glasgow Police Sports the following week, he ran well in the Mile (first class) buit was not involved in the finish of the handicap race although he ran the full distance in 4:25. In the SAAA championships on 28th June Calderwood turned out in the Mile and finished third. The Glasgow Herald reported on the three races in which he took part as follows. “Tom Riddell’s victory in the Mile was decisive and the form he displayed indicated that despite his comparative inaction during the past two seasons, he is just as good a runner as when he lived amongst us. He cut out the pace himself from the start, and only on one occasion did Donald McLean get on terms with him. Riddell did not run in the half mile but we had an inkling of what might have happened had he had, for he met HC Maingay and WH Calderwood in the half mile of the relay, and decisively defeated them both by the same cutting-down tactics. The victory of Maingay in the half mile was easily gained as, though both WH Calderwood and Donald McLean turned out, they were obviously using it as a pipe-opener for their main event – the mile. ” WH Calderwood finished behind Riddell and McLean in the Mile. That and his form throughout the season was good enough to gain selection for the Triangular International with England and Ireland in July when he was third behind C Ellis of England and T Riddell of Scotland. Between the Championships and the International, he was to run in an invitation half-mile at the Partick Thistle Sports at Firhill where he finished second ‘after his characteristic finishing burst’. Calderwood did not appear in any championship in the winter of season 1930-31, but he did run in the Edinburgh to Glasgow Relay held in April. Running on the first stage, he was second, only 13 seconds behind Clarke of Plebeian Harriers who set a stage record. However he was active as usual over the summer of 1931. Glasgow held a Civic Week in the first week of June that year with athletics meetings being spread over six days. The experiment was not a success – it was maybe too much to hope that athletics fans would turn out on ever day of the week – but Calderwood ran in the invitation 880 yards where he was beaten for first by five yards, his conqueror being a new young athlete named CW Wells from Edinburgh. On Saturday 13th June, St Peter’s AC held their inter club contest at Celtic Park once again and this time Maryhill Harriers made a clean sweep of the track races, except for the Junior One Mile team race where they had not entered a team. In the One Mile team race, those keen rivals WJ Gunn, Donald McLean and WH Calderwood were again arrayed up against each other, and again they served up a thrilling finish. Gunn once again proved the better tactician and his final effort proved too much for his Maryhill rivals. The placings between the Maryhill and Plebeian clubs in this race, were very close – 12 to 13 in favour of the reigning champions.” He also ran in the Two Miles relay which, of course, Maryhill also won. The following week, at the last meeting before the SAAA Championships, Calderwood ran in the Glasgow Police Sports over the first half mile of the Two Miles Relay Race against James Hood. Calderwood won that battle with a time ‘2 -5th sec over even time’ . The Championships were held at Hampden on 27th June and Calderwood’s target was the 880 yards. Calderwood won his Heat – held in midweek – before the championship proper on Saturday 27th. There he was second to James Hood of Shettleston and then in the final won bronze behind Hood and Wells in a slow race, won in 2:04.2. The report in the ‘Herald’ read: “The necessity of having stewards at the bends was emphasised in the half mile final. From the stands, it was observed that there was much unnecessary jostling taking place and it culminated when JP Laidlaw was brought down. It was a slow run race this, the slowest in twelve years. The first quarter was covered in 64 seconds and the whole in 2 min 4 1-5th sec. But the final, fought out between James Hood of Shettleston and CM Wells was the keenest for a long time. Wells was in front entering the straight, but after a stirring finish Hood managed to get on terms 20 yards from the tape to win by inches.” Calderwood also ran for the Maryhill Harriers team in the Relay where they were second behind Shettleston Harriers. In the Catrine AAC Sports in early August the report tells us that although Calderwood did not shine in the open half-mile (he was unplaced), he was much too good for others in the relay and his club went on to win. In the SAAA Championships on 25th June, the section of the report dealing with the half-mile was headlined “A Thrilling Finish“ and read “The half-mile was a fast race, and although scarcely as thrilling as the quarter-mile, was always interesting. The winning time 1 min 58 1-5th has only twice been equalled in the history of this race – once in 1926 and again in 1929 – and the seeker after coincidence will be interested to note that the three victories have been associated with victories by WH Calderwood. It was in 1926 that he gained his Four Mile medal, and in 1929 when he gained his Mile title. In the half-mile n Saturday, Calderwood’s stamina and finish were excellent and he owed something to the cutting-down tactics of TJ McAlister. The Beith Harrier set and maintained a pace that upset the others but suited Calderwood.” Following the meeting, the SAAA selectors picked the team to compete against Ireland at Powderhall on 16th July. The men for the 880 were WH Calderwood and JP Laidlaw with TJ McAlister as reserve. In the International all the races were run on grass and the report said that Calderwood ran very poorly – a comment that no writer nowadays would make and maybe the sport’s the poorer for that! “He lost yards on the bends and his usual strong finish was not there. The time 2 min 2 2-5th sec should have been well within his compass.” Maybe the scribe should have noted his comments that (a) the race was run on grass and not on the cinders that were more common. He said earlier in the report that “this was said to favour the visitors, and no doubt it did”, and (b) that Calderwood lost yards on the bends and put the two together! A ‘home’ international using a grass track which favoured the opposition, when there were good tracks in Glasgow and Edinburgh there for the using. Then on 23rd July he was back on club duty at the Eglinton Harriers meeting at Saltcoats where he ran the first stage for the winning Maryhill team in the One Mile Relay. In the Rangers Sports on a wet 6th August the quality of his running in the 1000 yards race was remarked on right at the start of the report. The actual race report came later and said: It is questionable whether WH Calderwood has ever shown better track sense than he did in the 1000 yards. He was given the mark of 15 yards, a surprisingly large concession in view of the quaklity of his running over the same distance at Celtic Park early last month, but even without it he would have proved the winner for his finish, excellently timed, was so powerful that it left the others standing. His time of 2 min 15 2-5th sec was, under the conditions, splendid and it would have been interesting had he run out the full distance. The two scratch men in the same race, Tom Riddell and Cyril Ellis, disappointed. Ellis never at any time during the race appeared happy, and the Scottish champion, although at the elbow of the leader at the bell, did not show much judgment. He covered the first quarter in 55 2-5th sec, the half-mile in 1 min 58 sec, and seemed like getting there but weakened visibly a furlong from home and faded out.” Calderwood also ran the first stage of the mile relay which Maryhill won. On 30th July at Sanquhar, running from scratch he was third in the 880 yards to me running from 3 yards and 50 yards and also took part in the mile relay which was again won by Maryhill. Season 1932-33 began as usual with the relays in November but Calderwood did not appear in any of them, nor did he take part in the National but he was back in harness for the Edinburgh to Glasgow Relay on 8th April where he ran on the third stage where, in running the equal sixth fastest for the leg, he maintained Maryhill in second place, although they were to finish third. That summer. On 3rd June he turned out in the Mile relay at the St Peter’s Inter Club meeting which Maryhill won but did not feature in any of the other events. In the Mile relay at the Glasgow Police Sports two weeks later he was second on the first stage and it was noted that he had yet to find his best form. And in the SAAA Championships there was no WH Calderwood mentioned at any point in the report or anywhere else in the results. His next appearance in the results columnbs was not until 29th July when he took part in the Ross County AAC Sports at Dingwallwhere he won the Mile and was second in the 880 yards: this was meeting supported by quite a few of the best from the West of Scotland so the races were not an easy option! He did not appear in the results of any subsequent meetings that season not the bigger ones such as the Rangers Sports nor in what were previously happy hunting grounds such as Darvel. There was another Edinburgh to Glasgow Relay on August 26th but it is unclear whether Calderwood ran in the team which finished sixth. In the SAAA Championships the following week, he appeared in the result for the Mile: the event was won by Tom Riddell from JP Laidlaw and W Strothers with WH Calderwood being listed as an also-ran. His next competitive outing was on 14th July at the Coylton Sports in Ayrshire where (off 10 yards) he was third in the 880 behind H Malcolm (Kilmarnock – off 40 yards) and Davie Brooke (Garscube – off 44 yards). Although he did not appearin the prize winners as listed in the Press, Calderwood continued to race ans was a popular athlete. He turned out at the Cowal Gathering on 21st August 1934. “It was pleasing to see the success of WH Calderwood, the back marker in the half-mile, for there is no more enthusiastic runner, week in, week out, than the ex-Scottish champion.” He won from 10 yards from RP Phoenix of Garscube off 46 yards and RV Lyons, South Glasgow off 40. Back in Ayrshire on 28th July, he was racing at Lugar. “J Scott is running into form and he won the half-mile in fair time, while WH Calderwood, another winner who is always at his best towards the end of the season, also figured in the prize list at the end of this race.” That was his last appearance in the prize-list for that season. Winter 1934-35 started with no Calderwood in either the District nor Edinburgh to Glasgow Relays. and finished wth no Calderwood in either District or National Championships. His return to the track however was as part of a One Mile relay team in the Monkland Sports on the last Saturday of May, 1935 which finished second. He won no prizes in individual events. His next recorded appearance was at the SAAA Championships on 22nd June when, with Bobby Graham, TJ McAlister and others, he was an ‘also ran’ in the half mile won by Stothard of Cambridge University in a new all-comers record of 1 min 53 6-10th sec. On August 12th, they were starting to talk of Calderwood in the past tense. When looking forward to a possible duel between Tom Riddell and Bobby Graham, they said that it should be the most interesting duel between two Scottish runners since Graham had raced WH Calderwood three years earlier. 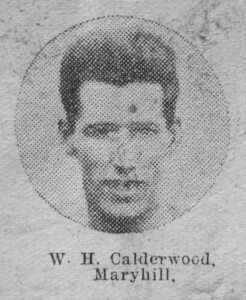 Calderwood did not appear in any results as a prize winner in June, July or the start of August in 1936 and given his absence from any Maryhill cross-country team over the previous winter, his career as a top class runner was probably over. It had been a remarkably interesting one – where most athletes start out with the shorter faster races and gravitate to the longer ones, Calderwood started with a medal in the 10 miles and worked his way down to the 880 yards via the Four Miles and the Mile. A genuine racer he was involved in many top class races and his record of running in relays over One Mile, Two Miles and Four Miles plus Team Races at One Mile, Two Miles and Three Miles speaks volumes for his enthusiasm and value to his club. He should be better known.